December 31, 2015-New Year's Eve! We woke up a bit earlier this morning but that left us time to make breakfast-bagels, sausage, eggs and even a cinnamon roll. It didn't take the kids long at all to eat breakfast but it took much longer for Robby and me to clean the kitchen and then start on a dessert for tonight and tomorrow. We even moved things around on and in the cabinets (again!) And there is even talk of more organizing in my kitchen pantry tomorrow. 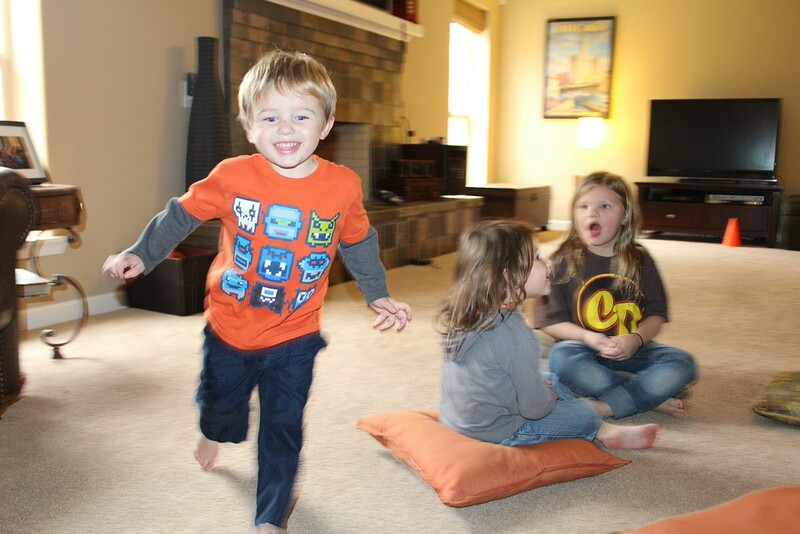 The kids played at Nonna's house while we ran to Kroger, the pizza place and my Chinese restaurant. Kroger for cokes (and some Christmas clearance), the pizza gas station for pizza for supper for Robby and most of the kids and Chinese for me and Reagan. After picking everyone up, we headed home for supper and before too long all the grandparents and Jason came over for dessert to celebrate the New Years. We had a rice krispy dessert, cheese cake and chocolate chip cookies. 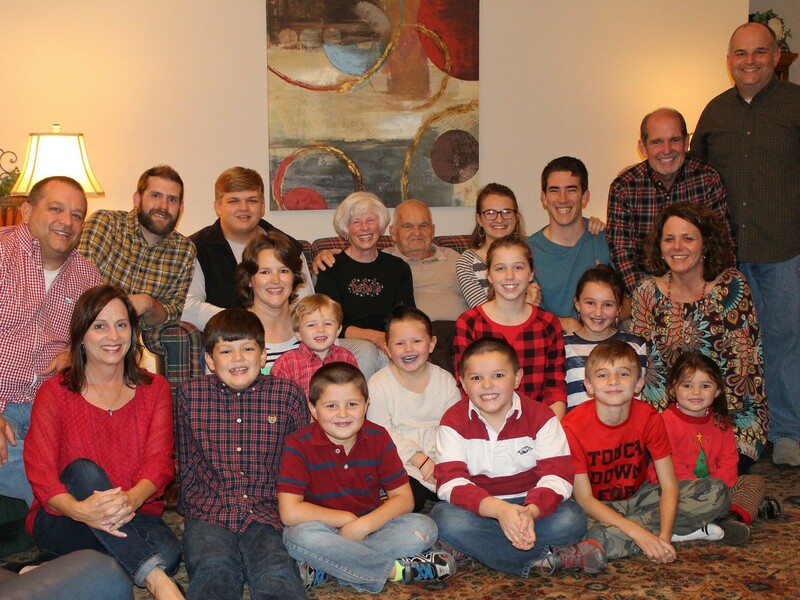 The kids watched some football, played a few games, colored, watched their kindles and enjoyed spending time with all of the grandparents. Once they all left, we cleaned up and headed upstairs. The first thing that I did was to put Whitman in bed but after a few minutes I then realized that if Whitman was in bed when he would miss the poppers and the New Year's eve pictures. So we then hurried to shoot off our poppers and to take our pictures before I put Whitman back into bed at 11:00! We did make some Dennie resolutions and I will post them and the updates to last years resolutions in another post. 1. Learn to play a song on the guitar. 2. Go to a baseball game. 3. Weigh less than 190 pounds this time next year. 1. Exercise 3 times a week. 3. Teach the kids to cook more. 2. 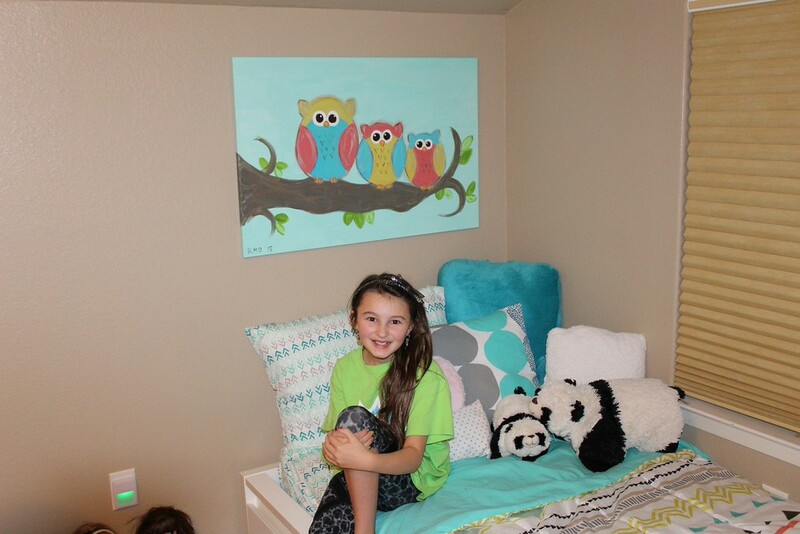 Get more accessories for her room. 3. Learn how to use the oven. 5. Go to a football game. 1. Play putt-putt with the family. 3. Go to Big Rock or Playtime Pizza. 4. Make breakfast for the family with Dad. 1. Go to a football stadium. 2. Learn how to write in cursive. 3. Learn to BBQ with Dad. 5. Learn to play basketball. 3. Go to Playtime Pizza. 5. Play all our games. 6. Make meals for the family. 7. Make a new friend. 2. 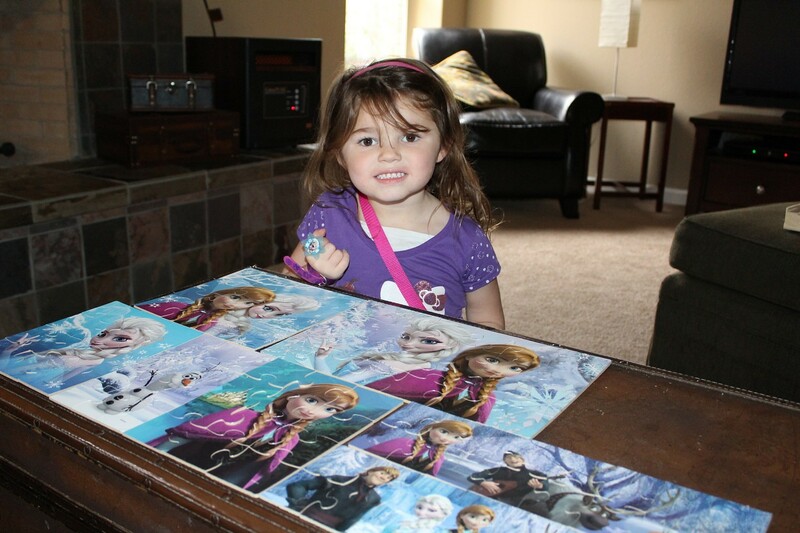 Play with Elsa doll and all her princess dolls more. 3. Play the Dora game on the Xbox. 2. Learn to sit still and obey. 3. Sleep in the boys' room. Campbell did prepare a pop tart for herself, Whitman and Keaton. Then she took my normal stool at the bar and read a few books to her little brother and sister as they ate their breakfast. Around noon, we left the house and had ourselves grilled cheese from Sonic (today it was on sale). The kids ate their sandwiches as Robby ran a few errands. Then we hit up the third Target looking for Campbell's toy to exchange but it was also not there. Campbell and I are getting a good workout sprinting around Targets looking for her item while checking out the Christmas clearance with Robby and the others waiting in the car. A few more stops and then to Grannymom's house for a few minutes followed by a trip to Walmart for the whole family. That was quite an adventure but we managed to pick up a birthday present, food for the next few days and the boys even found something to spend their money on. Last night they played basketball on Brett's new basketball toy so they found one in their price range and spent the rest of their Christmas money. So when we came home, the boys and Robby spent the rest of the afternoon putting together the new toy and having lots and lots of basketball shooting contests. Reagan had used one of her redbox gift cards today so she had tonight's activities planned-a movie, popcorn and coke. It was late when we had finished eating supper-hamburgers that Robby had grilled outside. Since Whitman had missed his afternoon nap, he also missed the movie and the rest of us snuggled on the couch to watch Tomorrowland. Looks like tonight will also be a late night for my crew so maybe we will have one more morning of sleeping in! King of Duck, Duck, Goose! I went to bed after midnight last night and didn't hear the girls upstairs but they were pretty convinced that they stayed up until 2:45. I don't think that could be right since my girls were decently behaved and in a pretty good mood during the entire day. But they must have still been tired this morning because it was again well after 8 when they started stirring. Whitman was the first one awake and I could hear him turning on and off his light in his room over and over again. This makes him happy and I probably would have let him continue this but my dad always told me that turning the light on and off could start a fire (I doubt that is true and is probably just something you tell your kids-like I tell mine.) So I opened his door and soon he was in bed between Robby and me covered up with his spider man blanket and watching Barney. The girls were soon up and we eventually got around to making their breakfast. Robby's current goal is to cook everything possibly in his new toaster oven and today we made cinnamon toast in it. The girls said the first batch of toast was good but the second batch was really great-the difference? Robby made the second batch and used much more sugar than I did! During the morning, I pretty much let the girls do whatever they wanted to do-they played some games, they watched some tv, they played with dolls and they played on Lilli's ipad. They were happy and entertained and Whitman can play with his trains for a very long time before coming to find me or going to watch a movie, so I had plenty of time to work. I planned January's school for Keaton and Campbell, refilled diapers and toilet paper, organized shelves in the school room closet, organized coats, put away some presents, moved toys around to new homes and stayed pretty busy...Robby did question my sanity since I had squandered my downtime with chores and not something worthwhile like taking a nap! The girls played an indoor soccer match this afternoon and before I stopped it, they had moved every piece of furniture in the living room and were having a big ole time. I guess they were making memories and I'm thankful that they helped move the furniture back. Around 3, Dana brought the boys back and picked Lilli up. I made everyone shower and they started playing until Nonna and Pops came over. They delivered a tea ring that Nonna had made today and we pretty much devoured the thing before they left. Nonna and Pops stayed for a bit and the kids enjoyed seeing them. Robby came home with some supper and soon the Wilsons were over eating with us. After eating, we hung out for a bit and then they went home...and we followed. Brett had a new basketball game that everyone had a chance to play and Tony had a new popcorn machine to try out. And while we were upstairs I asked for a sample of their soda making machine and Tony gladly made me one-which they exploded twice on us! Keaton almost slept until 8:30 this morning and probably could have slept longer but I finally thought that I should open her door and turn off the fan. We finally had breakfast-cereal and fruit-before starting our morning. The highlights of the morning were more shinky dinks, reading lots of Thomas book, working a zillion Elsa puzzles and reviewing some Fancy Nancy books for an upcoming birthday party. At 11, we did all make ourselves some hot chocolate (Keaton and Whitman just had milk) and had a few pieces of candy while we did our science and some reading. Whitman helped me make lunch-or mainly he would just lick the knife every time I laid it down. And then after lunch, I did put Whitman in his undies until nap time. He did great-no pottyng though so that probably isn't that great but he didn't get those undies wet. This afternoon the boys played the xbox and the girls watched a movie. I worked on planning school for next week and Whitman slept most of the afternoon. Around 4, we loaded up and dropped the boys off at Cash's house and brought Lilli home. Reagan had asked to use a redbox gift card but unfortunately our redbox was broken. Then it was back home and the girls played and played-they have played with the American Girl dolls and are now making a movie on Lilli's ipad. Robby made waffles and sausage for supper and we all ate it right up. I do believe that waffles is a favorite meal of my Dennie crew. My Whitman is right here beside me on the couch wearing goggles and watching Barney. The girls will probably watch a movie soon and then it will be bedtime for these kiddos. I have no idea why my kids sleep late on days that we have to wake up but they sure do. So as you can imagine, we had to really scurry around this morning but did manage to have everyone dressed and in the car with breakfast in their lap on time...and we had only drive about 2 miles before Campbell realized that she didn't have any shoes on her feet! Once at church, the kids saw all of the grandparents and then I dropped Whitman off to his class. Since we were just having big church today we let Keaton stay in with us. Now Keaton is a perfect little angel in big church but my Campbell tries her best but gracious she can not sit still at all! After church we headed to Dunkin Donuts to claim a free drink for me-large salted caramel hot chocolate-and it was delicious. Then we ran to Target for me and Campbell to see if they had her toy yet but they didn't so we went right on to Grannymom's house. Grannymom had lunch for us and the kids had some time to play before we headed home for the afternoon. This afternoon we really didn't do too much around the house-we did work on laundry at least a zillion times and finally folded and put away about 8 loads of laundry. This evening the boys watched Star Wars-the girls and Whitman tried to watch it but they didn't last too long. So we came downstairs and as Whitman watched his movie, Reagan made a bracelet, Keaton made a craft with her craft supplies and Campbell worked on her shrinky dinks. 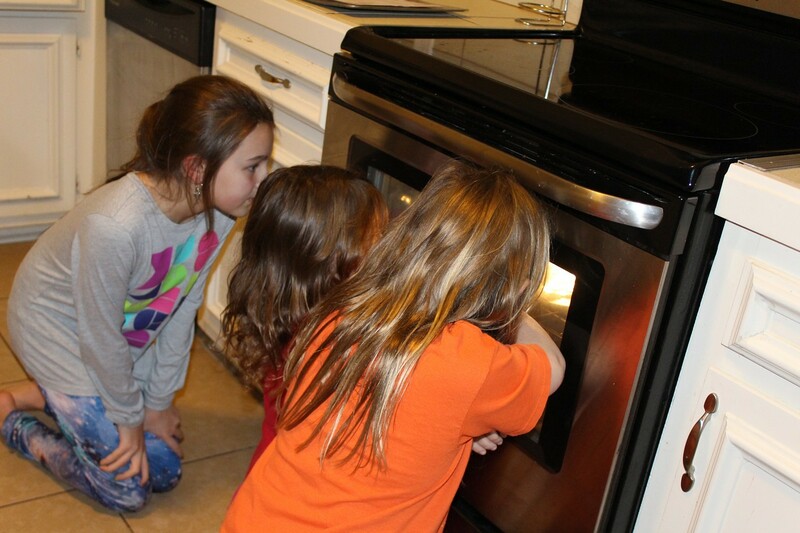 After the bracelet was finished, we watched the shinky dinks in the oven and it was a hit! We were just about to play a game when the boys movie was over so then it was bedtime for my little crew. We just have one more week off of school so I hope they enjoy it-I sure will! The pictures are from today along with a few from Christmas eve from Jason. From last night I forgot to mention that as we were playing our hover soccer tournament, Graham shouted out "this is the best Christmas ever!" And I might just agree with him. The thunder was crazy loud last night but Robby and I just heard it one time and then we woke up again to the sound of the power coming back on. We don't really know how long the power was off but we do know that the lack of power or the thunderstorm didn't bother us at all and everyone slept crazy well. Graham was the first one awake around 7:30 and then he told me that Whitman's light was on so I went in and retrieved him but everyone else didn't wake up until after 8. We didn't do a whole lot this morning but we did manage to clean up just a little bit before heading out to our "new day after Christmas tradition." That is how Robby referred to it on facebook this morning. I laughed because last Christmas eve we said that making pancakes for breakfast was going to be our new tradition but we decided that it was too much trouble. But today's tradition was much easier-lunch at Cotham's in Scott. Robby had seen an article about Cotham's in the paper and since it had been year and years since we were there last, we loaded up and headed out of town. The kids were great and took in the setting. We arrived before the rush and we were almost convinced that maybe it wasn't a popular as it once was but we were wrong, by the time we left people were waiting outside. It was a mad house and we loved it! We split 2 hubcap burgers and since we were divided into two tables (big 3 kids at one table and everyone else at another) it worked out just great. (Robby and I had a good laugh at everyone who just looks at our blog pictures-yesterday they probably felt sorry for my kids being thrilled about gatorade for Christmas yesterday then today the pictures make it look like we bought each of them a 12 dollar hamburger today-we only had 2 for all of us!) 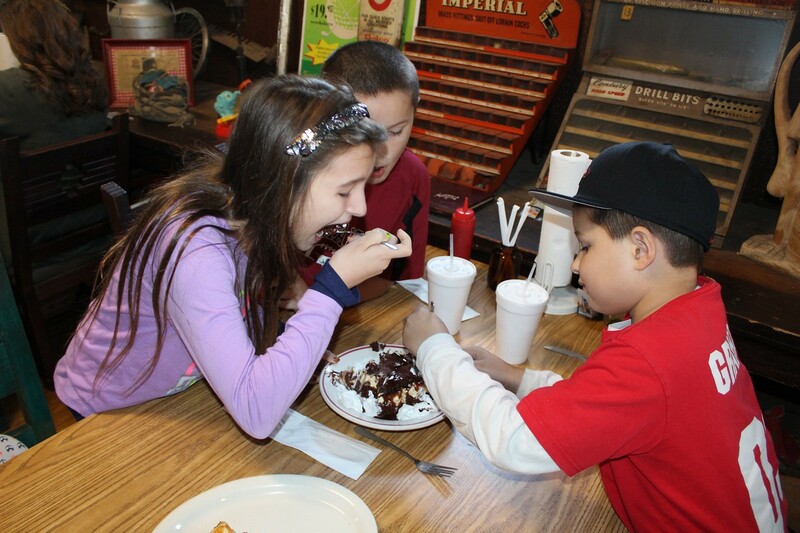 Then Robby thrilled the kids by ordering 2 Mississippi mud desserts and that meant one for their table and one for ours. I am sure that everyone in the restaurant watched my 3 big kids all standing up and shoving their dessert in their mouths as fast as they could-just like they were in an eating contest. Afterwards, we had a few returns and a few gift cards so we headed to Target. Since we were in NLR area we stopped at the Target there and Robby dropped me off so I could stand in the dreaded day after Christmas return line. But I was second in line as a lady opened another line and before I could put my driver's license away she had given my a gift card with my return money on it. Robby was still unloading the kids when I went to the parking lot to look for him. We walked around the entire store-they were out of Campbell's toy that she wanted, Reagan bought more Shopkins with her money and gift card, Anderson didn't quite have enough money to buy a pair of football gloves but Robby spotted him some and Graham was able to buy himself a pair as well. A few days ago both boys decided that they desperately needed football gloves but I had to tell them that it was way too late to think of asking for them this Christmas but in the end it all worked out well for them. Afterwards we headed home. I took a nap for Whitman-oh, he did eventually go to sleep but that was for only about 30 minutes. After his nap, we started working on pottying. If you look at the picture from today, you can tell exactly how well! Not very well! Ha! That boy has never pottyed on the potty for me but we still tried and tried. Once while he was on the potty, I was pointing at him encouraging him and he said "it's not working!" and no, it was not! Lessons were ended for the day when I had to clean pee off of the tv and dvr (seriously!) As I was cleaning up, he told me over and over "I am the best"-not really sure about that but peeing all over my tv sure was an accomplishment. Robby and I spent the afternoon and some of the evening in the kitchen-he was cooking and I was reorganizing the cabinets (I had to make room for his toaster oven, my canisters and new glasses.) Then it was time for supper-leftovers and lots of them. Our fridge was completely full and it still is. After sleeping fairly well this morning, we first heard the kids in the hallway upstairs a bit before 6:30. Robby ran to the steps in time to hear one of the boys coming back from the restroom. We had turned the alarm on so it chimed whenever they left their rooms and it did come in handy. Robby then had his shower while I listened to the kids get in and out of their beds upstairs and then I quickly woke Whitman up before we went upstairs to get the others. They could not wait to get out of their beds and they were all ready to head downstairs-except for Reagan who needed me to do her hair! The kids turned the corner to see the tree filled with presents underneath. Anderson was the first one to see his present-a huge present loosely wrapped. To my eyes it clearly looked like a bike but to his eyes, it was briefly what he had asked for Santa to bring him for the last 4 years, a motorbike. When he did open it, he might have been disappointed for like a second but then he was thrilled with his bike. Whitman was overwhelmed with all of the noisy and everyone was dumping out their stockings around him that he didn't really know what to do. He started working on his stocking and didn't get past the 3 little Thomas trains and stopped to play with them. Campbell had given everyone gifts that she had found around the house and was so excited to watch everyone open their gifts. (Reagan had made everyone gifts and Keaton had also found gifts around the house (pretty sweet little kids) When Graham opened his gift from Campbell, he was so excited to get a half used coloring book of Reagan's and a crayon. That child is just precious. Reagan was thrilled with her movie box from Whitman. I acted as his personal shopper and filled that box up with popcorn, popcorn flavoring, hot chocolate, mini marshmallows, candy, cokes and Redbox gift cards. And then she also opened a big blue pillow with gift cards to Altitude attached-she has plans of bringing some of her friends with her. By the time that we had half of the trash picked up, Robby and I headed to the kitchen to get started on breakfast. He had to stay in there working (he was playing too since he had opened up his toaster oven and griddle) and I went back to the living room to pick up some more. Jason, Nonna, Pops, Grannymom and Grandpa all arrived at pretty much the same time. The kids were so happy to show everyone their new presents and soon breakfast was ready. I made monkey bread and apparently I should make it more because the kids went on and on about how we only have it for Christmas. We also had bacon, eggs, biscuits and Pops brought his coffee pot so there was also plenty of coffee for the grandparents. After breakfast we had a bit of downtime and then it was time to quickly clean up (every year we let the time slip away from us and end up rushing to get to lunch on time) I had the kids get ready and clean some while I threw my cornbread in the oven for it to get a bit warm before heading to Dana's house for lunch. Robby worked on managing our trash that overfloweth. Dana had lunch ready when we arrived and everyone was there including Nonna, Pops and Jason. The kids ate and played in the garage while the grownups ate quietly inside. It was a pretty nice day and the kids had a great time playing inside and outside. After eating and playing, we headed home for the afternoon. We did what most people do on Christmas evening-take down the trees. I tell you it is so nice to have everything down and put away. The kids happily played while we worked and even though it took a longer than we had planned, we were able to get everything cleaned and back to normal. Robby again used his new toaster oven for nachos for supper which the kids gobbled down since it was pretty late. Campbell then used all of her new kitchen stuff to make brownies for dessert and while the cooked, we did the other thing that most families do on Christmas day-an indoor soccer tournament. Next up was Reagan and Anderson-Reagan won that round and next up was Campbell was was defeated by Graham. And then it was Keaton against Whitman-that was a very short but interesting match and Keaton was the winner. Then it was Keaton against Graham and that sweet boy even let her get a point before winning the game. Reagan then beat Robby and that left Graham and Reagan playing in the championship and Graham was the winner! Dessert was next followed by one last match-3 on 3 before heading to bed. It was a bit difficult getting everyone to sleep tonight since we had just played a soccer match, eaten sweets and had a wonderful Christmas day! Christmas Ornament Countdown: Merry Christmas! This Christmas day we shall close our Christmas ornament countdown with 2 ornaments. We had two big trips this year and I have saved an ornament from each one for last. First, we have our picture ornament from our Disney trip this year. It was another great trip and each visit we wonder if it will be as magical as it was the year before and we have yet to be disappointed. Here is the blog from the last day of our Disney visit. And then we have an ornament from our big road trip this year. This was our fourth time to visit the Louisville Slugger factory in Kentucky. The first visit we bought Anderson a bat and the next time Graham was bought a bat. We even toured the factory last year and that is when Whitman was bought his bat. This year we didn't have anyone that needed a bat but we did finally need an ornament for our tree. As you finish the tour of the factory, you are handed a pretty decent sized little bat and we finally realized that little bat would make a great Christmas ornament. Click here to look back at this year's trip. The bat on my tree may look a bit odd but since it is hanging near an elk antler, bag of flour, can of spam and a sandal it does fit right in! Christmas Eve with the Brocks! Sometime in the middle of the night Campbell climbed into bed with us. I was too tired to ask her why she came or to move her back to her bed or to even roll her over into the floor. She slept fine once in our bed and Robby and I manged to sleep some-though I did feel like a pancake when I woke up. Robby is reading a new book so he snuck off to the bonus room this morning while the kids were waking up and I just laid around in my bed as long as I could. 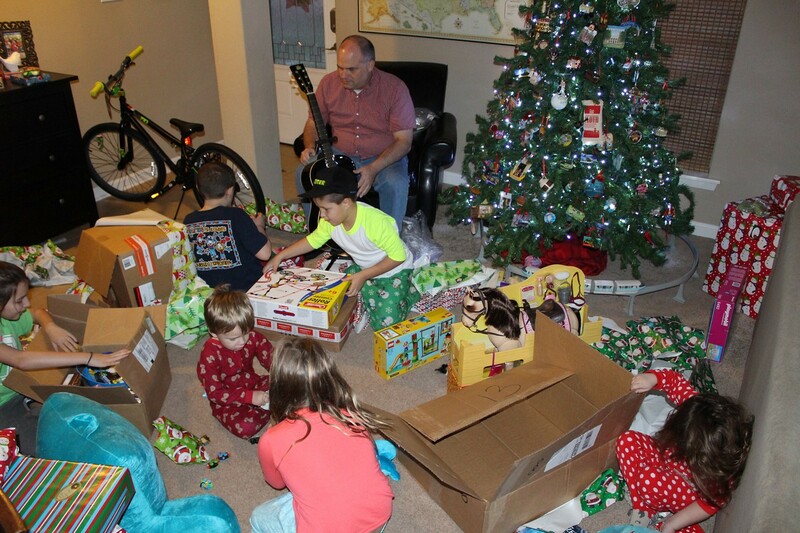 The kids soon became busy with wrapping and pillow making (Reagan), kindles (the boys), playing baby dolls (the little girls) and trains (Whitman) that they forget about breakfast and I sure didn't mention it. Eventually, Whitman pulled out the milk (love seeing the 2 year old walk around the house with a gallon of milk) and a box of cereal so everyone had a light breakfast. We did pretty much full around most of the morning but when we started working we did laundry, dishes, gathered clothes for tonight and in the morning, had lunch (spam and cheese and crackers), did our What God Wants for Christmas box, cleaned rooms, read our Bible story and talked about an ornament one last time-when we kick things into high gear, we really mean it. My Keaton and Campbell could never really understand that this was not Sunday and we were still going to church. The could never wrap their little minds around today but they knew that we were ending up at Nonna's house for presents. Our first stop was Beebee's place for our Christmas visit. She was in a good mood and the kids were all pretty perfect. She was happy with her gifts-socks and a calendar with the kids pictures on it. Then we were off to church for the candlelight service. This silly weather was crazy hot and made things feel a bit non-Christmassy-and it probably didn't help much that church was so early this year. Robby decided that we should live life on the edge and let Whitman stay in for the service. He did very well the first few minutes and even went down to the front with all of the children. Reagan took him by the hand and they went up to the front (we only hear him a few times) and right in front of them sat Campbell and Keaton who also walked to the front hand in hand. The boys were of course right up front loving every minute of it. When it was time for the kids to go back to their seats, Whitman told me that he was going to blow his whistle and we took that as our cue to get him out of there. His whistle is not a whistle at all but a high pitched yell that he will do over and over until he decided to put "his whistle" in his pocket. Back in the service, my other babies sat dutifully through the little sermon waiting on the singing of Silent Night with the candles. They could not wait for this part and this is what they will remember when they grown and gone. After church we headed to Nonna's and Pops' house for supper. While we waited on supper to be ready, we played a few rounds of leftover bingo (leftover from Anderson's birthday party-though now the prizes were from the pantry). The kids are at an age right now where it doesn't take too much to really excite them and bingo did the trick-and kept everyone happy for just a few more minutes. After opening presents, Robby left for a bit. Graham was the only one who noticed that he was gone and I just told him that he was going to get him a puppy (he knew this was not the truth.) Actually, I had bought the same gift that Nonna had for Anderson so Robby ran to pick up something else. Surprisingly, he was able to quickly find another similar item so all will be well Christmas morning. After a bit of playtime and dessert after presents, we headed home. The first order of business was spreading out the reindeer food and then Robby read The Night Before Christmas. Then it was bedtime for the kids-we left their trees on tonight and minutes ago Robby went to turn them out and both of the rooms had already turned their trees off. I guess they really wanted to go to sleep and didn't want for their bright trees to keep them up. Now, Robby and I are just waiting for all of our little people to fall asleep so the magic can begin! My second favorite stop this year in Buffalo was the Herschel Carousel museum. (My favorite stop was Paula's Donuts.) The factory is the one that even made the carousel at the zoo in Little Rock. We were all able to ride a carousel and the kids rode a few different ones. It was a neat little stop and here are the pictures from that day. When Graham was asked what to eat this morning, he asked for waffles but we were all out of those so we resorted to the last box of pancakes. After we ate our breakfast, we read a few of our Christmas books-I looked back and last year we had again waited until the last minute to read those books. I don't know why since I have had them out for over a month now. We had our lunch and after a few minutes, it was time for all of my people to have a rest. Whitman takes forever to go to sleep and today was no different-he talks, he sings, he plays with his trains, he jumps, he yells, he hums and he even tells stories about his trains all while falling asleep. Today though I also wanted Keaton and Campbell to take a nap as well. It took pretty much forever for them to fall asleep but once they were asleep they were out! Eventually, we had to wake everyone up so all of my people could have a shower before heading to Grannymom's house tonight. The kids didn't fool around much when they realized where we were going. They were quick to get ready and load up. Once we were at Grannymom's house, we unloaded our presents under the already full tree. Then Les did a quick devotion followed by the syran wrap game. Robby and Grannymom had wrapped a huge ball of syran wrap around lots of goodies (gift cards, candy and the like) and then we each took turns racing to unwrap it and claim the goodies until the person beside us rolled the number 6 on the dice. Whitman sat in my lap and watched wide eyed as the adults screamed and hollered as we worked on the syran wrap ball. Reagan-the games of Life and Apples to Apples, a brush, shopkins, sticky notes, a bracelet kit and another craft. Anderson-a Razorback jersey, Academy gift card, books, a Game stop gift card and 2 outside toys. After opening presents, we had a bit of downtime-the boys played outside and the girls played a board game. We were the last to leave and when we came home, it was time to unload and shower again for the crew. We only have one more night of our Christmas nightly routine and the kids were so excited that they could hardly listen to anything Robby said tonight. It was a great start to Christmas. Back to the ornament, at the end of our Disney trip we headed to St. Augustine for a day and were quite surprised at how much we enjoyed it. The Castillo San Marco was a huge fort in the middle of the city. The kids enjoyed exploring it and whenever I see this ornament, I will always remember the progressive dinner of food that we had later that night (french fries, pizza, popcorn, garlic knots, waffle and key lime shake!) Click here for the pictures of that day. The morning started early this morning. Reagan is the slowest to usually wake up so I started to wake her up first. I did figure out the magic words to get her moving quickly: I asked her "do you want for me to pick out your clothes?" She was out of bed in seconds digging through her drawers trying to find her clothes. The boys were quickly up and Graham asked me about a zillion times when we were going to leave. We were actually ready a few minutes before 7:15 and left right on time. We met our friend Veronica and the Heltz at the air force base. We went right to the building that houses the simulators for the C130s. We had a few minutes before our time and we were shown some maps and the kids even tried on a few helmets. Then it was simulator time. Wes went with the first crew-his girl and my Reagan and Graham. They were all able to fly the simulator and even spotted the church, Bass Pro and altitude. I had no intentions of going on the simulator but since there was room, I thought that I better not pass the up on an opportunity like that. Anderson and Ethan were the only ones on this trip so they were both able to fly some. Anderson did two touch and gos at the Little Rock airport after taking off at the base. We also flew around downtown and our pilot was great with the kids. It was a pretty awesome experience. On the way home, we stopped by Target to pick up one last present (there was nothing left there), then to the library and finally to Nonna and Pops' house to pick up the others. Robby had taken Keaton, Whitman and Campbell to Nonna's house this morning so he could go to work. We joined them for lunch and then headed home to get a few things done at home. Once at home, we worked on the dishes, laundry, science and even did a science experiment with Anderson's new science kit. Campbell tried out most of her art supplies and her herself a fit when I told her that I was not going to make cupcakes today so she could use her new dishes! The afternoon was spent with a few naps (it is Christmas time after all!) and lots of time wrapping presents. Keaton and Campbell found gifts for everyone in the house so I helped them wrap them-Reagan will be thrilled with opening a half used glue stick on Christmas morning! Then it was supper at Izzys-we had not eaten there in a very, very long while and had a tiny gift certificate. We all split cheese dip, spaghetti, tamales and a hamburger. Once back at home, it was time to make reindeer food for Santa's sleigh pullers. Then it was bedtime for my tired pilots! We have had 3 trips to the Liberty Bell but I think that this ornament was actually bought in a set with a few similar ones before we even made it to the Liberty Bell. The original plan had been for Robby and I to draw a state out of the hat and that would be the state that we would visit each year of our anniversary. Philadelphia was our first state to draw so in 2001, we flew to Philly for the weekend and caught our first glimpse of the Liberty Bell. Then we went back in 2009 with only three little Dennies (click here for those pictures) and then again during this year's big road trip. What happened to the drawing names? Well, we traveled more than we ever would have imagined during our first 8 years of marriage and emptied our hat of names and finished all 50 states with a visit to New Hampshire in 2008. December 21, 2015-Happy Birthday Campbell! After keeping the kids up very late last night, I was surprised to see that they had slept until 7:30. Not as late as the 9:30 or 10 that I could have slept until but I will take what I can! Today was Campbell's actual birthday so of course we needed to start the day off with candles. I didn't think that a candle in her cereal would work really well so I quickly made some cinnamon rolls for the first singing of the day. I had a schedule ready for the day and the highlight was our ping pong championship. I even had a loser bracket. My first game was against Keaton and I tried my best to let her win a few points. Then I played Graham and won but then it was Reagan and that little stinker beat me. Graham kept hollering that I was letting her win but I guarantee you that I was not. I will definitely schedule a rematch. We did our science today-yes, we are out of school for the next two weeks but I we are behind and I am going to use this chance to catch up. Afterwards, it was time to do some party preparations-making Campbell's brownie cake was the next biggest part of the morning after our championship games. Lunch was next and the kids helped with some chores followed by some downtime for them. Robby was home in time to run the birthday girl to the doctor for a quick check up. She has almost finished her antibiotics but is still complaining of ear pain and still coughing like a 2 pack a day smoker. Doctor looked in her ears and said that all was well. So that was a unneeded trip but made Robby and I feel much better. 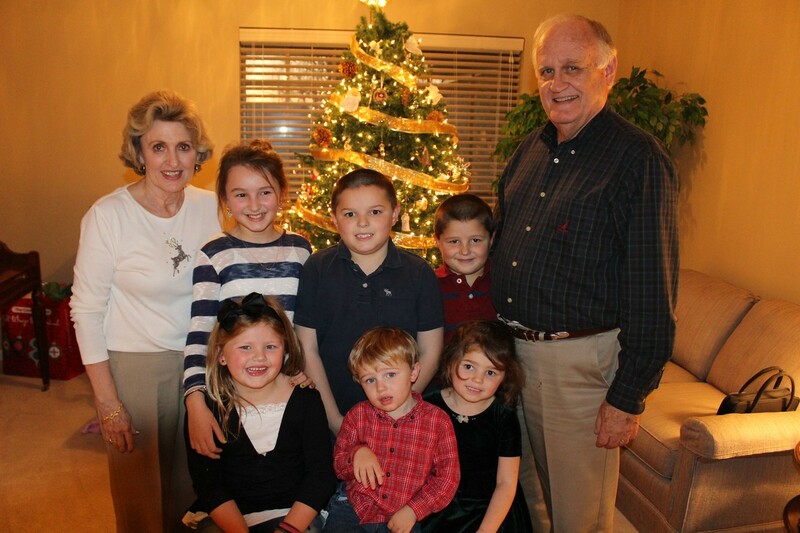 Once they were back home, it wasn't too long before Campbell's 6th birthday began. Nonna and Pops were over first to help cut my tomatoes and soon after Jason, Grannymom and Grandap, Lilli, Cash and Dana all arrived. Then the McGuires, Wilsons and Skelleys all came. 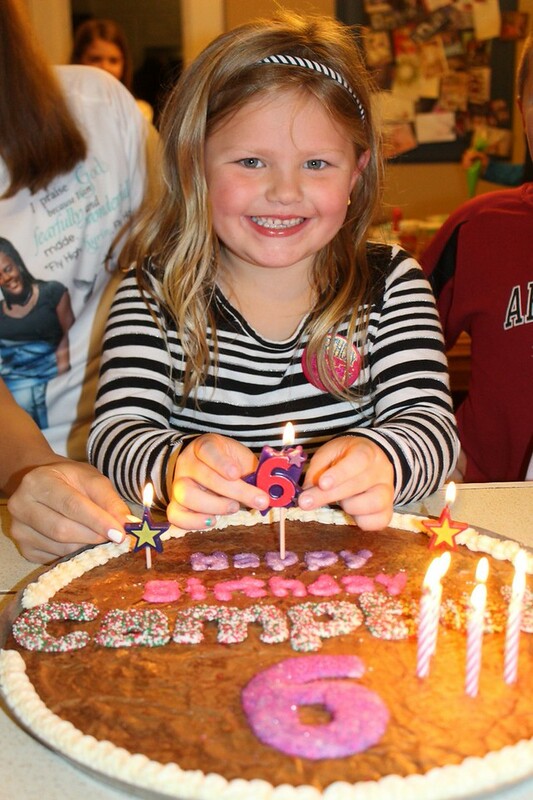 My Campbell was so excited to have a completely full house of people over to celebrate her birthday. All of the girls decorated cookies and the boys probably would have happily decorated cookies too but we just didn't have room. (10 girls and just 5 boys) There was icing everywhere and sprinkles and the kids just had a great, messy time. I even decorated a cookie or two. Then it was present time and my Campbell racked up-a cooking set, boogie board, lap desk, Frozen tin, lots of art supplies and the list just goes on. She did really well and wanted to start tearing everything open as fast as she could to play with tonight at bedtime. After everyone left, the kids helped clean up everywhere except the kitchen (the only really messy room) and then they showered as we worked on the kitchen. After our December nighly ritual, it was time for bed for the kiddos. Robby is still going to mop the kitchen floor and I have presents to wrap...or maybe we will just eat some spinach dip. 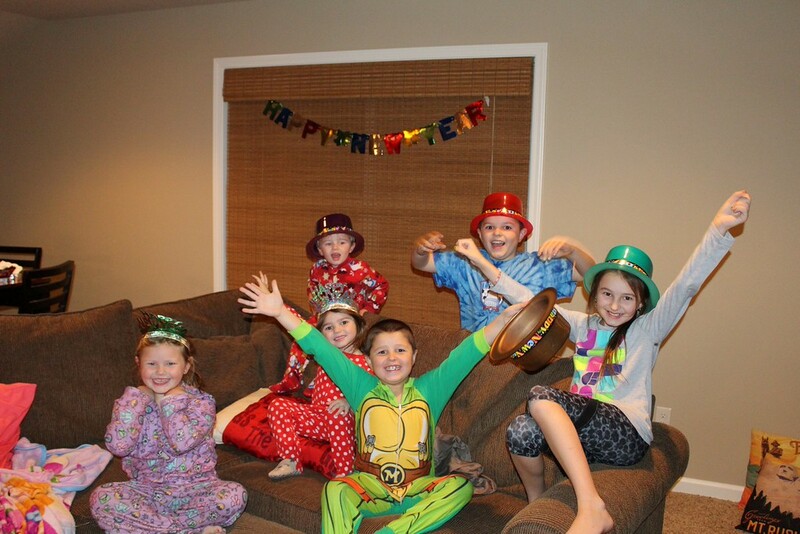 December 13, 2015-Happy Birthday Anderson!